September 5, 2018, InterDrone (Las Vegas, USA) - Parrot today strengthens its Parrot Business Solutions portfolio with the release of two new innovative platforms: the senseFly eBee X and the Parrot ANAFI Work. Launched with the promise that “it’s not about the drone,” but instead about overcoming business challenges, these reliable aerial solutions offer highly accurate insights, whatever the user’s level of drone experience and budget. The senseFly eBee X fixed-wing drone is designed to boost the quality, efficiency and safety of geospatial professionals’ data collection. This enterprise-grade solution offers a camera to suit every job, the accuracy and coverage capabilities to meet the requirements of even the most demanding projects and is durable enough to work virtually every site. The senseFly S.O.D.A. 3D: a unique drone photogrammetry camera with a one-inch sensor, which changes orientation during flight to capture three images (two oblique, one nadir) every time, instead of just one, for a much wider field of view. The result is stunning digital 3D reconstructions in vertically-focused environments-such as urban areas, open pit mines and coastlines-over larger areas than quadcopter drones can achieve. senseFly S.O.D.A. 3D is optimised for quick, robust image processing with Pix4Dmapper software. The senseFly Aeria X: a compact drone photogrammetry camera with APS-C sensor. This rugged innovation offers an ideal blend of size, weight and DSLR-like image quality. Thanks in part to its built-in Smart Exposure technology, it provides outstanding image detail and clarity, in virtually all light conditions, allowing operators to map for more hours per day than ever before. The senseFly Duet T: a dual-camera thermal mapping rig, which lets mapping professionals create geo-accurate thermal maps and digital surface models quickly and easily. The Duet T includes both a high-resolution (640 x 512 px) thermal infrared camera and a senseFly S.O.D.A. RGB camera with one-inch sensor. Both image sources can be accessed as required, while the rig’s built-in Camera Position Synchronisation feature works in sync with Pix4Dmapper photogrammetry software (optional) to simplify the map reconstruction process. The eBee X is also compatible with the Parrot Sequoia+ multispectral camera for agriculture, the senseFly S.O.D.A. drone photogrammetry camera and senseFly Corridor for simple linear mapping. The eBee X can meet the exacting requirements of every project. Its unique Endurance Extension option unlocks a flight time of up to 90 minutes (versus a maximum endurance of 59 minutes by default). With this capability activated, the drone is able to achieve vast single-flight coverage of up to 500 ha (1,235 ac) at 122 m (400 ft), while the eBee X’s built-in High-Precision on Demand (RTK/PPK) function helps operators to achieve absolute accuracy of down to 3 cm (1.2 in)-without ground control points. The eBee X allows users to work virtually every site, no matter how demanding, thanks to the drone’s built-in Steep Landing technology, ultra-robust design, live air traffic data and more, all backed by senseFly’s professional, localised support. The eBee X is ideally suited to the varied and evolving needs of mapping professionals. 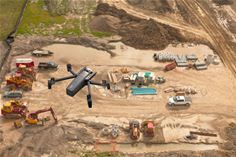 These include: surveying and construction companies, quarry and mine operators, agronomists and forestry engineers, professional drone service providers, aerial imagery companies, environmental researchers and more. The eBee X is supplied with senseFly’s eMotion flight planning and data management software and is available for purchase immediately from authorised senseFly distributors (listed here https://www.sensefly.com/sensefly-distributors/). Professional image processing software by Pix4D, another Parrot subsidiary, is optional. ANAFI Work is a 4K ultra-compact drone solution for everyday business use by construction professionals, independent contractors, site managers, architects, creative agencies and more. Based on Parrot’s highly-acclaimed ANAFI drone (launched in June 2018), this highly capable, advanced imaging tool makes it easy, and safe, to inspect those hard to reach areas of buildings, and to monitor, model and professionally shoot projects from the sky. ANAFI Work features a 4K HDR video, 21 MP high-resolution camera. The camera’s three-axis stabilization system allows the drone to shoot ultra-smooth videos and take steady photos. It also features a controllable +/-90° tilt camera, which is unique to the market, allowing professionals to inspect under structures such as balconies or bridges with the Zenith view (+90°) and roofs with the Nadir view (-90°). ANAFI Work’s camera is also equipped with a lossless zoom of 1.4x in 4K, 2.8x in full HD (1080p), and up to 3x standard digital zoom, allowing professionals to get a closer look at issues, when required, without reducing footage quality, and all while staying a safe distance away from walls. ANAFI Work boasts industry-leading flight performance, with a 25-minute flight time per battery (four batteries are included). The drone is ultra-compact, weighing in at 320 g (0.7 lb), and its four arms can fold and unfold in less than three seconds, making it an ideal ready to use tool for busy professionals. It also features a USB-C charging system, which charges 70% faster than standard USB-A, and enables the drone to be charged on-the-go with smartphones, laptops or power banks. Thanks to its powerful yet quiet propulsion system, ANAFI Work can fly in wind of up to 50 km (31 mi) per hour, plus its omnidirectional transmission system always maintains a strong radio connection, thanks to four dual band antennas embedded in the drone. With ANAFI Work, every professional can fly manually and take images of all types of infrastructure using the intuitive FreeFlight 6 mobile app. Flying autonomously meanwhile, and acquiring precise data, is made easy with the app’s pre-integrated piloting modes: Touch&Fly, POI (Point of Interest), and Flight Plan. Missions are also made stress-free due to the drone’s Geofence and Smart RTH (Return to Home) functionalities: Geofence allows the operator to define a specific flight zone with a maximum height and maximum distance, making sure the drone stays in the defined mission area, while with Smart RTH, ANAFI Work is always able to return to its initial take-off position with the single push of a button. Moreover, with ANAFI Work, Parrot invites professionals to experience quick and easy 3D modeling by offering a one-year subscription to Pix4Dmodel. Architects, roofers and construction workers, for example, can use ANAFI Work with Pix4Dmodel to take accurate measurements, perform post-flight 3D inspections, share markers or 3D models directly using any web browser or export their output to their preferred architecture software. At senseFly, we believe in using technology to make work safer and more efficient. Our proven drone solutions simplify the collection and analysis of geospatial data, allowing professionals in surveying, agriculture, engineering and humanitarian aid to make better decisions, faster.